CDR. Asra "Cougar" Kron, profile photo 2016/2017. Seychelles Isles Coast Guard, 2013 - 2014 serving as S.A.R. 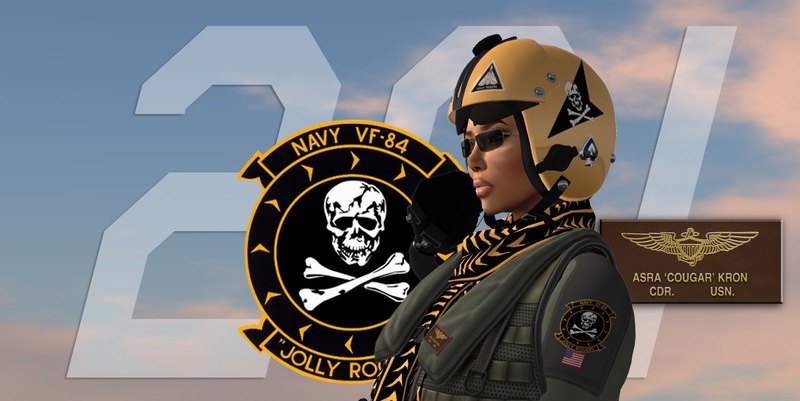 and RECON pilot, rotary and fixed wing; United States Navy SL, 2014 to present serving as carrier squadron pilot with VF-101, CVN-68, CSG 11, with VF-84 as squadron commander and other V squadrons at N.A.S. Miramar, and C.S.A.R. pilot with HSC-4 and other H squadrons at N.A.S. Miramar and instructor with VT-10, HT-28 at N.A.S. Miramar; having served under the command of Captain Jericho Napoli, S.I.C.G., Captain Alec Juventa, C.A.G. CVN-68, CSG 11, and Rear Admiral Isaac L. Harcassle, U.S.N.S.L. 3rd Fleet. In a very small nutshell, I decided to introduce myself to the new members of the USNSL, in particular Third Fleet's, and refresh some of the older ones' memories. It is an example among others of what service is and how I see it. In a time where in real life we witness the attempt of some to rewrite History, let this be a reminder that facts matter and there are never two versions of a verified fact. If there seem to be, one is true and the other is false. Here is to Miramar and over a year of History. Miramar is built on a private island region, to serve as a full scale, fully operational naval air station. Its purpose: to revitalize the USNSL and serve as a platform for carrier based squadrons ashore and ultimately be the center of Intermediate and Advanced Flight Training. Being a LTJG at the time when CSG 11 and in fact the USNSL both went dormant I stayed one even when flying alone with USNSL colors. As I decided to make Miramar come true I took the rank of Commander that was as meaningless as Miramar was sitting on an isolated private island with nowhere to go. And as meaningless as the Miramar operational group without operations. On January 8, 2016, the station was introduced to then Captain Isaac Harcassle. Its purpose and mission was explained as was my role and position should Miramar be accepted into the USNSL and Third Fleet. It was. In fact, by then it was the only fully operational naval air station the USNSL had. Captain Alec Juventa was present on the occasion. By being accepted, Miramar became an official USNSL station and my new rank confirmed in the presence of both my former and future commanding officers. Not many can claim that feat. Then began the transformation of the USNSL from a group of many tendencies and time lines that mixed operations and mere information into a real "mother group" where the true operational groups are aggregated. 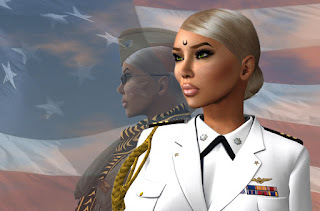 Soon after that open letter to the Fleet the Third Fleet group was created and I structured it, naturally with RADM Harcassle in the owner role, shared with me, as founder, and CAPT. Alec Juventa as senior most senior officer. I am to this date the senior most fully active officer in Third Fleet after RADM. Harcassle in both time and rank. NAS Miramar at its largest area: The Naval Air Station on Du Sud and NASM East on Deder, 2016. "When I first set foot onto Miramar, I knew it was special. I had just returned from a personal hiatus, and Commander Kron kept the ship together in my absence. 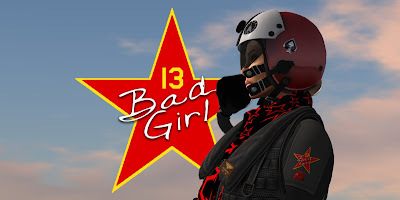 Miramar was our one and only foothold on the grid, the only reminder that there even WAS a United States Navy Second Life. So one year later, here we are. The station is as magnificent to visit and look upon from the sky as ever. So Commander Kron, thank you for laying down the keel of the ship; the foundation for our triumphant return, expansion, and success. Congratulations to one year of exemplary service for Naval Air Station Miramar, and here's to many more." Here is a concise list of major accomplishments between January 1st, 2016, to this day. See footnotes for more details about each item on the list. 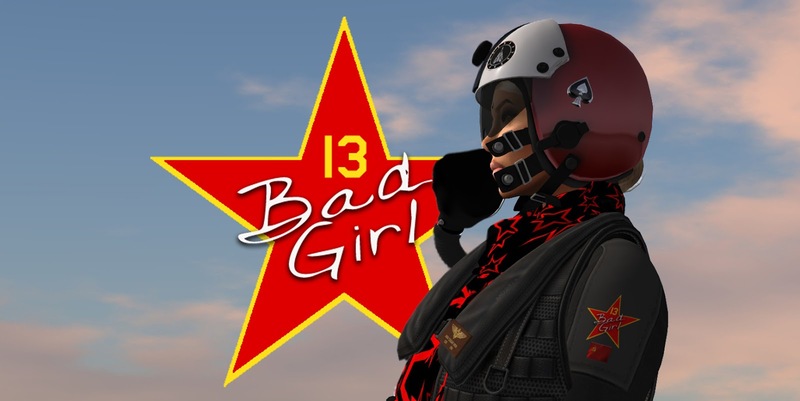 (1) First live entry on Miramar's weblog: "Intro". (2) "The First Gold and Blue Day". (3) NASM East had a naval base supporting fast boat patrols in the Tuarua Fiji regions, the Map Room and the Miramar Officers House, a club house open to all USNSL naval officers. It was closed in the first quarter of 2017 due to changes in my real life situation that forced me to downsize USNSL and private properties substantially. The Map Room was preserved and transferred to Du Sud Isle, where it is today. (4) Our weblog: "NAS Miramar". (5) Together with the Landmaster system that helps prepare pilots for carrier landings and fine tunes landing on a conventional strip, NAS Miramar has since February 2, 2016, a flight data base concerning the usage of every runway, this shows the efficiency of the station and the validity of its concept - "NAS Miramar Flight Records". (6) SCMs (Station Command Memos) and NASMCO Office notes set the standard for verifiable and accurate records of activity. These records are available to Miramar officers on site together with personal records and classified documents that can be obtained through various degrees of security clearance access. (7) Example of a SCM: "SCM013/16 Discharges and Code of Conduct". A total of 55 SCMs and 49 NASMCO Office notes were dispatched to this date (April 2017). These do not include everyday official "group notices" that usually do not require a record. (8) "Tuarua Fiji PATROUs Procedure". (10) "GridTalkie Protocols", "Third Fleet GridTalkie Guidelines". (11) In March 2016 there were a series of incidents involving NASM officers and the existing USNSL JAG Office that lead to the separation of Third Fleet from that office and the persons responsible for it, leading to the formation of a more professional and procedure/protocol aware JAG Office inside Third Fleet's structure. The SCM referred on (7) and the entry "Complaints of Wrongs" triggered that event. 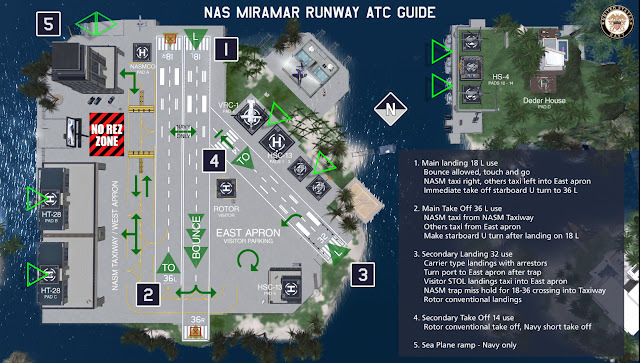 (13) "ATC Basic Class at Miramar", GT classes at Miramar follow the protocols mentioned on (10). (14) "Introduction to Naval Aviation". (15) As the, at the time, Board of Seniors eldest active officer, it was my privilege to start and finish the process of endorsement of Isaac L. Harcassle, Jr. to the rank of Rear Admiral Upper Half. 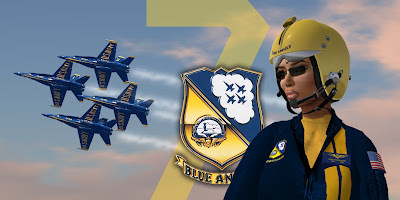 "SCM019/16 USNSL 3rd Fleet Command"
(16) "NFDT Blue Angels Procedures". (19) "3RD FLEET Inventory - Aircraft - By BuNo" - The implementation of the bureau number record system similar to the one in use by the United States Navy (which was standard at NAS Miramar (18) from day one) was extended as the standard for Third Fleet by my recommendation in "Directive 01/12/2017". (20) Resulting from the need of a global ATC frequency that anyone can use regardless of groups, and unlike the regional global channels like "Marine" or "Blake" that are used for emergencies only and were becoming more and more "spammed" by ATC comms, I asked GridTalkie creator Rez Gray to add a dedicated global ATC channel to all GT packs. The idea was implemented soon after and it is now the standard global ATC channel on GridTalkie. 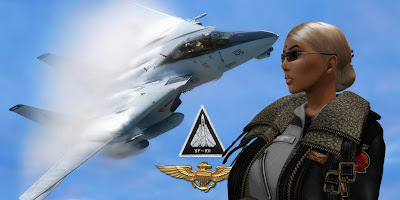 (21) Basic Flight Certification (BFC) was already in place in 7th Fleet and through cooperation with NAS Miramar a common core of practical and theory BFC classes was put in place. Several Miramar instructors regularly cooperate with 7th Fleet instructors to streamline new NA candidates ready for Intermediate Flight Training on their progression towards the Wings of Gold. "BFC Class at NAS Miramar". (22) "IFTR Intermediate Flight Training". AFTR is achieved by participating in front line squadrons advanced missions and special deployments with the NFDT, the NFWS and the USNTPS. (23) "Squadrons of Third Fleet". (24) "Miramar 3rd Fleet Christmas Run". (26) This service was free for NASM Officers from January to December 2016. It is now available to all Third Fleet and USNSL naval aviators for around a third of the market price. "III Fleet Special Price List". (27) USNTPS "Lightning evaluation? Not so fast..."
(29) Miramar has seen officers come and go, and we have been fortunate with the level of commitment of those who stay and also with the achievements of some of those who transfer to other USNSL locations. Of the 33 officers that Miramar welcomed at the start of their career in Third Fleet, 13 are residents at this time (April 2017), 8 of which in full active duty. With a success ratio of 25/100, Miramar is one of the most demanding Naval Aviation deployments, requiring a combination of commitment, dedication, work, ethics and skill uncommon to the average NA, NFO or AWO. "SCM009/16 Navy Procedure". (30) A few examples: "TA-4J Skyhawk"; "EMB-120 Brasilia"; "F-14A Tomcat"; "NH-90"
(31) "NAS Miramar - Uniforms". (32) "The Super Hornet Saga Continues"; "Old 66 Underway"; "Blue Angels 7 and 8 get new Cougar '2 Up'"; among many others. The consistent work on the research and development field with concrete Navy asset assessment and applications led to the institution of the USNTPS (27). (33) Among them: "ID4 Airshow"; "A New Season Begins". (35) "Miramar Action Shots 2016". (37) The BuNo records (18), (19); GT institution and protocols (10), (13); the continental command areas ("COMNAVAIR Regions Approved"); the "3rd Fleet Surface Vessels Registry"; are among the many protocols and procedures implemented in USNSL Third Fleet as standards. (38) "When oak leaves fall..."
And that is who I am and what my 16 months in USNSL Third Fleet look like.